Oats, rice, wheat, corn. Again. Yogurt and oats. Peanut sauce. I knew it would be a challenge to keep myself fed for a three-day vegan meditation retreat, but I was tired of trying to get full on veggies alone. Now, there’s not much to complain about when I’ m spending glorious silent time among soaring redwood trees and stunning Buddhist temples. I thought of it as a good test run for being in a foreign culture, and it was. I practice meditation, so I was excited to learn that my meditation teacher was holding this retreat in California while I was staying within an hour and a half of its location. It was a no-brainer to go and a nice opportunity to quiet my busy mind, get out of the concrete of Silicon Valley, and connect with the familiar damp greens and browns of the redwood forest. I ate a big meat-based breakfast before I left on Friday, because I knew the only meat I’d see for the next three days would be walking around on legs or flying on wings. So I wasn’t all that surprised when I was greeted at the gate to the mountaintop retreat’s 373 acres by a huge flock of enormous, colorful turkeys. Yes, colorful! You ever seen those suckers up close? H-U-G-E. Colorful. And every single male had a full-on spread of tail feathers. What a greeting! These guys had seen several Thanksgivings come and go. I didn’t get a pic because I was driving, but I did see this flock several times throughout the weekend. Those males are very, very proud of their tail feathers. I remember these from camping during my childhood. What can I say about what I ate? Stewed pears with blackberries for breakfast, lettuce leaves and carrots and a banana for lunch (oh, and nuts), and vegetables in hot water for dinner. I’m not kidding. Wasn’t even seasoned. And you know what? I didn’t mind. I felt . . . lighter. I had forgotten that I don’t mind that little-bit-hungry feeling. I decided to just enjoy the experience. Oh, but you knew that was coming, didn’t you? 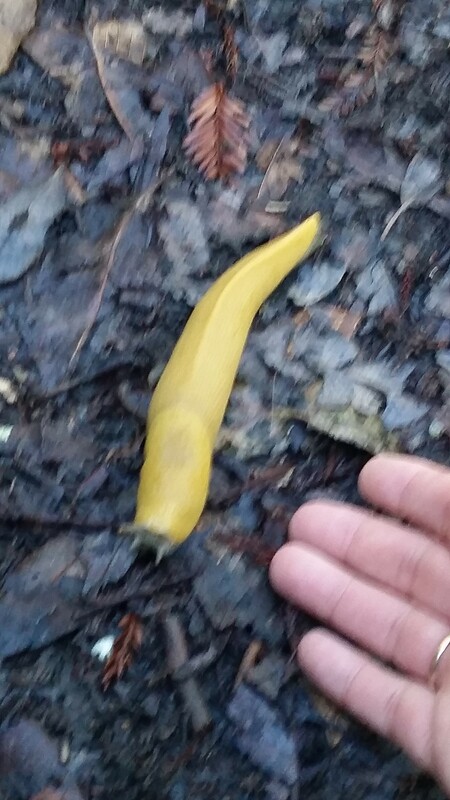 Well, did you see the banana slug coming? 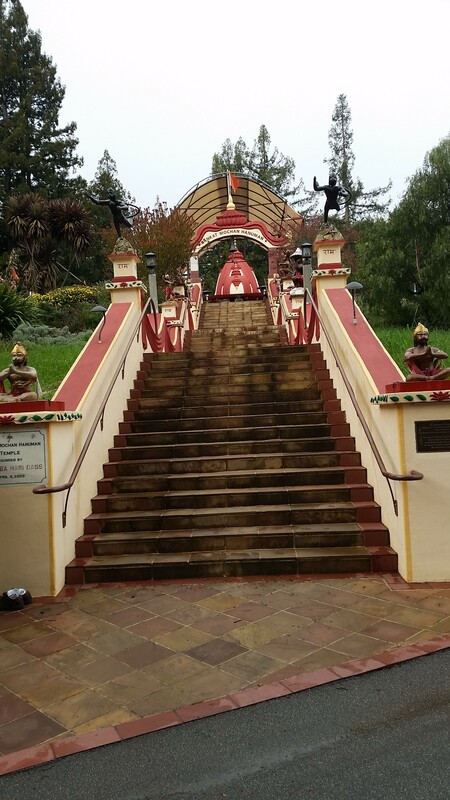 I ventured on several meditative walks through the redwood forests surrounding the retreat center, soaking in the damp green air, the soft-as-down moss on giant grey boulders, the majestically soaring redwoods. I reconnected with my breath, my quiet, the stillness of now. 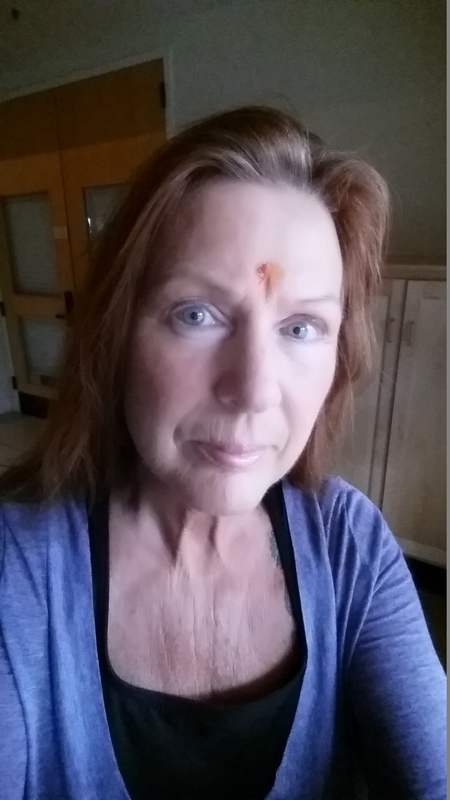 I imagined that I was in India, among a culture I know very little about. This last one was easy, as there were twice-a-day ceremonies at the temple, where dozens of locals, most of them from India, came to do whatever it is they do at a temple. I sat with them as they rang bells and clanged instruments a nd sang in a language I didn’t understand. I had my forehead marked and smoke waved over my head and was handed a tiny bowl of . . . something white and grainy. Crap. I knew it was probably something very un-Paleo. What to do, what to do. I was . . . so . . . hungry. I decided to eat, then ask. I picked up a little bit with my fingers and brought the moist, fluffy white stuff to my mouth. Ohmydog, it was sweet. I mean SWEET. I ate the rest. The priest (what are they called at a Hindu temple?) with the floor-length dreads piled on his head said “Oh, that’s made of chickpea.” I smiled in thanks. Chickpea, chickpea. Pretty sure that is a legume, right? I ate a tiny bowl of sugar-filled beans, completely the opposite of Paleo. Dang it. Fortunately, I didn’t suffer any gastric repercussions like I do if I eat a grain, but it did make my heart beat faster. Guilt? I got a lot of meditation in, too, by the way. I am glad I was reminded that I don’t mind feeling hungry. I am appreciative to have done a test-run for what it might feel like in a country that is mostly vegetarian, because I remembered that I will not starve. I feel deep gratitude for this one precious life, this reminder to slow down, to see the moss and the salamanders and the stunningly colorful Indian fabrics and the tiny purple flowers, to hear the wind and children’s laughter and a bird rustling in the dead leaves. As my meditation teacher reminded us, This is your life. Don’t miss it. Wouldn’t that be cool to decorate in colors like that! Thanks for commenting, Heather!